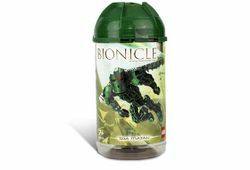 8605 Toa Matau is a BIONICLE set released in 2004. This is the second form of Matau released, the first being a Turaga. The third and last is his Hordika form. Toa Matau is a member of the Toa Metru. The model is aboat the average height of the other Toa Metru. Matau also has a similar build to the other Toa Metru. It has three exclusive parts. Part:47311 in Dark Green, Part:49423 in Dark Green, and Part:47313 in Transparent Red. It includes a Kanoka card with a code for a BIONICLE instant win game. It also comes with the final instructions for a combo model with 8601 Toa Vakama and 8604 Toa Onewa to make Kralhi. The instructions also include a map of Metru Nui. Also is explained how combining two canister lids a Matoran Sphere could be created. The model has two removable aero-slicers that double as wings. After Matau became a Toa Metru, he was concerned more about fame and glamour of being a hero, rather than the work. Once Vakama had the vision of the six Great Disks, Matau was immediately ordered by Vakama to go find the Le-Matoran Orkahm. Matau eventually found Orkahm in a web of transport cords. He managed to get the Matoran out and escaped before the Morbuzakh reached them. Vakama then had the Toa and Matoran split into pairs to find the Great Disks. His partner on this mission was Nokama. Matau rescued the Great Disk from a Force Sphere in The Notch, almost killing himself in the process, and helped Nokama find the Great Disk of Ga-Metru under the Great Temple by providing a distraction for the Vahki that were chasing them. They then entered Ta-Metru to find the Morbuzakh. After nearly being killed by Morbuzakh seedlings and gaining entrance to the Great Furnace with the help of a Matoran Nui, Matau with the other Toa Metru faced off against the king root with the other Toa, killing it with their Great Disks. After defeating the monster plant, Matau and the other Toa where told to go down into the Archives by Nuparu. Then and there, he and the other Toa fought Rahkshi and an intelligent Rahi known as Krahka. They defeated the Rahkshi and the Krahka and headed up, and out of the Archives. Matau and the other Toa were ready to be hailed as Toa by Turaga Dume and the Matoran. Instead, they were branded as impostors. Unbeknownst to the Toa, there really was an impostor — Dume himself. Teridax, under the guise of Dume, planned to place the Matoran into hibernation and then wake them up to serve him — and him alone. Nuju, Onewa, and Whenua were all trapped under the Coliseum while Vakama, Nokama, and Matau escaped to safety. After many encounters and adventures, Matau and the others were all reunited, along with Turaga Lhikan. Now the Toa had one last mission to accomplish — defeating Teridax. After a long battle on the Great Barrier, the six Toa Metru trapped the Master of Shadows in a Protodermis prison. During the battle, Turaga Lhikan sacrificed himself to save Vakama and the Vahi, Mask of Time. Now the Toa had to find a new home for the Matoran with no guidance — a mission which was filled with many trials. The Toa Metru managed to make it above ground, to the island which they christened Mata Nui. The island was filled with wild Rahi, several habitats, and was many times larger than Metru Nui. Matau chose a dense jungle for the home of his Matoran, as it reminded him of the Chute systems in Le-Metru. But before the Matoran could come and live here, they would have to be rescued - a mission which would change Matau forever. When he had seen what had happened to Le-Metru after the earthquake, it filled him with grief, especially the destroyed and abandoned Test Track and Moto-Hub. Matau wore a Mahiki Mask of Illusion, which not only allowed him to create illusions but also shapeshift. He could duplicate the voices of those he impersonated, but did not assume their powers. He carried two Aero-Slicers which were strong enough to cut through energy fields and could also serve as glider wings and rotors; they also channeled his elemental air power. The Box Size in cm is 9.5 x 9.5 x 18.9. The Weight is 160 grams. This is a description taken from LEGO.com. Please do not modify it. (see an archive of the product's page) High-flying protector of Metru Nui! Facts about "8605 Toa Matau"
This page was last edited on 22 April 2019, at 04:09.